Coma, from the Greek word "koma," meaning deep sleep, is a state of extreme unresponsiveness, in which an individual exhibits no voluntary movement or behavior. Furthermore, in a deep coma, even painful stimuli (actions which, when performed on a healthy individual, result in reactions) are unable to affect any response, and normal reflexes may be lost. Coma lies on a spectrum with other alterations in consciousness. The level of consciousness required by, for example, someone reading this passage lies at one extreme end of the spectrum, while complete brain death lies at the other end of the spectrum. In between are such states as obtundation, drowsiness, and stupor. All of these are conditions which, unlike coma, still allow the individual to respond to stimuli, although such a response may be brief and require stimulus of greater than normal intensity. In order to understand the loss of function suffered by a comatose individual, it is necessary to first understand the important characteristics of the conscious state. Consciousness is defined by two fundamental elements: awareness and arousal. Awareness allows one to receive and process all the information communicated by the five senses, and thus relate to oneself and to the outside world. Awareness has both psychological and physiological components. The psychological component is governed by an individual's mind and mental processes. The physiological component refers to the functioning of an individual's brain, and therefore that brain's physical and chemical condition. Awareness is regulated by cortical areas within the cerebral hemispheres, the outermost layer of the brain that separates humans from other animals by allowing for greater intellectual functioning. Arousal is regulated solely by physiological functioning and consists of more primitive responsiveness to the world, as demonstrated by predictable reflex (involuntary) responses to stimuli. Arousal is maintained by the reticular activating system (RAS). This is not an anatomical area of the brain, but rather a network of structures (including the brainstem, the medulla, and the thalamus) and nerve pathways, which function together to produce and maintain arousal. Coma, then, is the result of something that interferes with the functioning of the cerebral cortex and/or the functioning of the structures which make up the RAS. In fact, a huge and varied number of conditions can result in coma. A good way of categorizing these conditions is to consider the anatomic and the metabolic causes of coma. Anatomic causes of coma are those conditions that disrupt the normal physical architecture of the brain structures responsible for consciousness, either at the level of the cerebal cortex or the brainstem, while metabolic causes of coma consist of those conditions that change the chemical environment of the brain, thereby adversely affecting function. A decrease in the delivery to the brain of substances necessary for appropriate brain functioning, such as oxygen, glucose (sugar), and sodium. The presence of certain substances that disrupt the functioning of neurons. Drugs or alcohol in toxic quantities can result in neuronal dysfunction, as can substances normally found in the body, but that, due to some diseased state, accumulate at toxic levels. Accumulated substances that might cause coma include ammonia due to liver disease, ketones due to uncontrolled diabetes, or carbon dioxide due to a severe asthma attack. The changes in chemical levels in the brain due to the electrical derangements caused by seizures. As in any neurologic condition, history and examination form the cornerstone of diagnosis when the patient is in a coma; however, history must be obtained from family, friends, or EMS. The Glasgow Coma Scale is a system of examining a comatose patient. It is helpful for evaluating the depth of the coma, tracking the patient's progress, and predicting (somewhat) the ultimate outcome of the coma. The Glasgow Coma Scale assigns a different number of points for exam results in three different categories: opening the eyes, verbal response (using words or voice to respond), and motor response (moving a part of the body). Fifteen is the largest possible number of total points, indicating the highest level of functioning. The highest level of functioning would be demonstrated by an individual who spontaneously opens his/her eyes, gives appropriate answers to questions about his/her situation, and can carry out a command (such as "move your leg" or "nod your head"). Three is the least possible number of total points and would be given to a patient for whom not even a painful stimulus is sufficient to provoke a response. In the middle are those patients who may be able to respond, but who require an intense or painful stimulus, and whose response may demonstrate some degree of brain malfunctioning (such as a person whose only response to pain in a limb is to bend that limb in toward the body). When performed as part of the admission examination, a Glasgow score of three to five points often suggests that the patient has likely suffered fatal brain damage, while eight or more points indicates that the patient's chances for recovery are good. 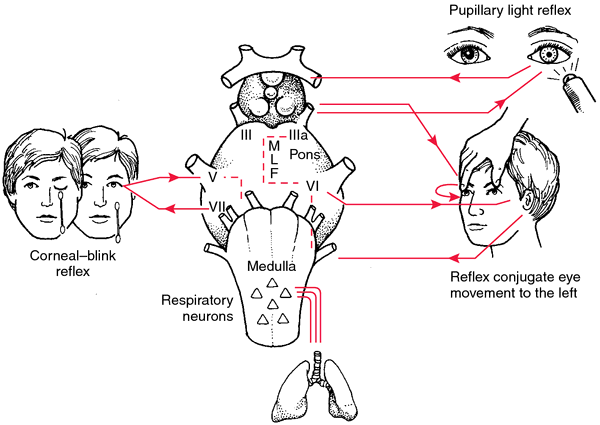 Expansion of the pupils and respiratory pattern are also important. Metabolic causes of coma are diagnosed from blood work and urinalysis to evaluate blood chemistry, drug screen, and blood cell abnormalities that may indicate infection. Anatomic causes of coma are diagnosed from CT (computed tomography) or MRI (magnetic resonance imaging) scans. The four brain conditions that result in coma. with the correct amount of oxygen, glucose, or sodium; by treating the underlying disease in liver disease, asthma, or diabetes; and by halting seizures with medication. Because of their low incidence of side effects and potential for prompt reversal of coma in certain conditions, glucose, the B-vitamin thiamine, and Narcan (to counteract any narcotic-type drugs) are routinely given. Some conditions that cause coma can be completely reversed, restoring the individual to his or her original level of functioning. However, if areas of the brain have been sufficiently damaged due to the severity or duration of the condition which led to the coma, the individual may recover from the coma with permanent disabilities, or may even never regain consciousness. Take, for example, the situation of someone whose coma was caused by brain injury in a car accident. Such an injury can result in one of three outcomes. In the event of a less severe brain injury, with minimal swelling, an individual may indeed recover consciousness and regain all of his or her original abilities. In the event of a more severe brain injury, with swelling that resulted in further pressure on areas of the brain, an individual may regain consciousness, but may have some degree of impairment. The impairment may be physical (such as paralysis of a leg) or may even result in a change in the individual's intellectual functioning and/or personality. The most severe types of brain injury, short of death, result in states in which the individual loses all ability to function and remains deeply unresponsive. An individual who has suffered such a severe brain injury may remain in a coma indefinitely. This condition is termed persistent vegetative state. Outcome from a coma is therefore quite variable and depends a great deal on the cause and duration of the coma. In the case of drug poisonings, extremely high rates of recovery can be expected following prompt medical attention. Patients who have suffered head injuries tend to do better than do patients whose coma was caused by other types of medical illnesses. Leaving out those people whose coma followed drug poisoning, only about 15% of patients who remain in a coma for more than just a few hours make a good recovery. Those adult patients who remain in a coma for greater than four weeks have almost no chance of eventually regaining their previous level of functioning. On the other hand, children and young adults have regained functioning even after two months in a coma. Coma Recovery Association, Inc. 570 Elmont Rd., Suite 104, Elmont, NY 11003. (516) 355-0951. Anatomic — Related to the physical structure of an organ or organism. Metabolic — Refers to the chemical processes of an organ or organism. Neuron — The cells within the body which make up the nervous system, specifically those along which information travels. Physiological — Pertaining to the functioning of an organ, as governed by the interactions between its physical and chemical conditions. Psychological — Pertaining to the mind, its mental processes, and its emotional makeup. Stimulus/stimuli — Action or actions performed on an individual which predictably provoke(s) a reaction. a state of unconsciousness from which the patient cannot be aroused, even by powerful stimuli. Traumatic brain injuries are the most frequent cause; other causes include severe uncontrolled diabetes mellitus, liver disease, kidney disease, and neurologic conditions. Evaluation of a patient in a coma is comprehensive. The underlying cause should be identified so that appropriate treatment can be initiated. magnetic resonance imaging, electroencephalography, and brainstem auditory evoked potentials give information about electrical activity of the brain in a patient who is comatose, although the results are not predictive of recovery. Some patients are able to emerge from a coma. In others, the coma may progress to a persistent vegetative state in which the functions of the brainstem and circulation remain relatively intact or may be supported with assistive technologies. Patients in irreversible coma may meet the criteria of brain death. Schematic representation of major brain stem reflexes used in coma examination. From Marx et al., 2002. Patient Care. Assessment of the patient in a coma includes an evaluation of vital signs, determination of level of consciousness, neuromuscular responses, and reaction of the pupils to light. In most hospitals a standard form is used to measure and record the patient's responses to stimuli in objective terms. The glasgow coma scale is a standardized tool that aids in assessing a comatose patient and eliminates the use of ambiguous and easily misinterpreted terms such as unconscious and semicomatose. Additional assessment data are gathered relating to the underlying cause and the patient's immobility; these include evaluation of the gag and corneal reflexes. In the absence of gag reflex, regurgitation and aspiration are potential problems. Abnormal rigidity and posturing in response to noxious stimuli are motor responses to coma. Decorticate rigidity is abnormal flexor posturing, with the arms, wrists, and fingers drawn up. The legs may be extended with plantar flexion. This type of rigidity usually indicates a lesion in the cerebral hemispheres or a disruption of the corticospinal tracts. Decerebrate rigidity is abnormal extensor posturing: in response to painful stimuli the extremities extend rigidly and the palms turn outward. This type of rigidity is indicative of damage to the brainstem and as a rule is a sign of greater cerebral impairment than is decorticate rigidity. Comatose patients are predisposed to all the hazards of immobility, including impairment of skin integrity and development of pressure ulcers and contractures. A multidisciplinary, coordinated plan of care is essential. Families should be encouraged to be actively involved in care of the patient. The health care team should also recognize the family's need for support; the emotional and financial impacts of coma are usually significant. alcoholic coma coma accompanying severe alcoholic intoxication. alpha coma coma in which there are electroencephalographic findings of dominant alpha-wave activity. diabetic coma the coma of severe diabetic acidosis; see also diabetes mellitus. hepatic coma coma accompanying cerebral damage resulting from degeneration of liver cells, especially that associated with cirrhosis of the liver. hyperglycemic hyperosmolar nonketotic coma (hyperosmolar nonketotic coma) see hyperglycemic hyperosmolar nonketotic coma. Kussmaul's coma the coma and air hunger of diabetic acidosis. myxedema coma an often fatal complication of long-term hypothyroidism in which the patient is comatose with hypothermia, depression of respiration, bradycardia, and hypotension; usually seen in elderly patients during cold weather. 1. A state of profound unconsciousness from which one cannot be roused; may be due to the action of an ingested toxic substance or of one formed in the body, to trauma, or to disease. 2. An aberration of spheric lenses; occurring in cases of oblique incidence (for example, the image of a point becomes comet shaped). alcoholic coma stupor accompanying severe alcoholic intoxication. diabetic coma the coma of severe diabetic acidosis. hepatic coma coma accompanying hepatic encephalopathy. metabolic coma the coma accompanying metabolic encephalopathy. uremic coma lethargic state due to uremia. A state of deep, often prolonged unconsciousness, usually the result of injury, disease, or poison, in which an individual is incapable of sensing or responding to external stimuli and internal needs. a state of profound unconsciousness, characterized by the absence of spontaneous eye openings, response to painful stimuli, and vocalization. The person cannot be aroused. Coma may be the result of trauma, space-occupying brain tumor, hematoma, cerebral edema, toxic metabolic condition, acute infectious disease with encephalitis, vascular disease, or brain ischemia. See also Glasgow Coma Scale, unconscious. Neurology A state of unarousable unconsciousness; a sleep-like state; not conscious Etiology Head injury, neurologic disease, acute hydrocephaly, intoxication or metabolic derangement or hypoglycemia. See Barbiturate coma, Diabetic coma, Induced pentobarbital coma, Pseudocoma. A state of deep unconsciousness from which the affected person cannot be aroused even by strong stimulation. Coma can result from head injury, oxygen lack, interruption of the blood supply to the brain, poisoning and various disease states such as those occurring in uncontrolled diabetes, liver failure and kidney failure. a tuft of hairs attached to the testa of a seed and used in wind dispersal. a state of unrousable unconsciousness, of which the severity can be assessed by testing the reflex responses to various stimuli. comatose adj. See also Glasgow Coma Scale (GCS), recovery position. Monochromatic aberration of an optical system produced when the incident light beam makes an angle with the optical axis. The image appears like a comet with the tail pointing towards the axis. See aplanatic lens; sine condition. Profound unconsciousness from which one cannot be roused; may be due to the action of an ingested toxic substance or of one formed in the body, to trauma, or to disease. n a state of unconsciousness from which the patient cannot be aroused, even by powerful stimulation. It is gradual in onset, prolonged, and not spontaneously reversible. n the state of unconsciousness accompanying severe diabetic acidosis. It may develop from lack of insulin, surgical complications, or disregard of dietary restrictions. Premonitory symptoms include weakness, anorexia, dry skin and oral cavity, drowsiness, abdominal pain, and fruity breath odor. Late symptoms are coma, air hunger, low blood pressure, tachycardia, dehydration, soft and sunken eyeballs, glycosuria, hyperglycemia, and a high level of ecetoacetic acid. See also shock, insulin. a state of unconsciousness from which the patient cannot be aroused, even by powerful stimuli. coma in which there are electroencephalographic findings of dominant alpha-wave activity. the coma of severe diabetic acidosis. See also diabetes mellitus. results from reversible biochemical abnormalities of the cerebrum, caused by elevated blood levels of toxic substances such as ammonia, amino acids, short-chain fatty acids and beta hydroxylated biogenic amines that accumulate in severe liver disease. See also hepatic encephalopathy. coma in which for a period of 24 hours there is complete nonreceptivity and nonresponsivity even to the most intensely painful stimuli, no spontaneous movement or breathing, absence of elicitable reflexes, and a flat electroencephalogram. Called also brain death. the mental stupor caused by severe hypothyroidism; seen most often in Doberman pinchers, it is associated with hypoventilation, hypothermia, hypotension and bradycardia. Death may occur. En el mercado, los clientes hacen fila y esperan turno, para llevarse las tortillas recien cocidas en el comal, prefieren hacerlo asi que comprar las guardadas en el chiquihuite, a pesar de que tambien estan practicamente recien hechas, pues su elaboracion no excede las dos horas. El fogon, aqui por extension comal, es continuacion del paraiso original que palpita desde el vientre de la madre. In Comal Springs, two invasive species of freshwater snail have potential to compete with E.
Also, from a teacher's perspective, it was extremely important that the tool allow students to record their voice so that their fluency could be monitored," explains Jennifer Wivagg, Comal ISD's instructional media specialist. Primero, los huaraches: tortillas algo gordas y alargadas, asadas en comal y fritas en manteca o aceite; (3) suelen sazonarse con salsa roja o verde, queso rallado y, en el colmo de la glotoneria, cubrirse con huevo--estrellado o revuelto--, chorizo, bistec, higado encebollado o una oronda costilla de res asada. Y en ese momento de mi divagacion, llego al comal de las quesadillas y saluda a la marchante. The historically large volume, steady flow, and warm temperature (74[degrees]F or 23[degrees]C) of the Comal River created habitat for the fountain darter and, unfortunately, a non-native snail, the red-rimmed melania (Melanoides tuberculatus), and its accompanying parasitic trematode or flatworm. La Casa de enfrente, producida por Casa Comal, denuncia las realidades mas acuciantes del presente guatemalteco. She rises at three to pat the moist cornmeal into tortillas and toss them on the sizzling comal (a kind of skillet) as the fire dances beneath. OUR partner COMAL has developed a new way of trading for local communities. Consumer plaintiffs state they were unable to purchase wine from Dry Comal Creek Winery in Texas, Hood River Vineyards, in Oregon and Miura Vineyards, California, due to Virginia laws. On page 853, note 42, Comal Springs fell below 200 cfs in "41%" of the years during the period from 1958 to 1998, not "43%. Comanche County Telephone Co., Inc.